There are thousands of MLS listings in the Seattle area at any give time. Filtering through these listings can be very time consuming and overwhelming. Findourpad is updated every 15 minutes and is more accurate than Zillow, Redfin, Realtor, & trulia. Our search comes directly from the real estate agents MLS, while other sites allow owners to update their information which a lost of times just isn't accurate. With our search tools you can filter your results by city, price, MLS number, year built, sq footage, lot size, style of home, bedrooms, bathrooms, school districts, garages, waterfront, amenities like near a bus line, swimming pool, fire place, & golf course properties. 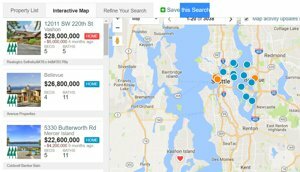 You also have the option to search using the Seattle MLS real estate map option. Save time by creating an account and saving your search. Get auto updates by email when a new listing comes up or a home price drops into your price range. You can also request to tour a home online or ask questions about a particular property. If you still can’t find what you’re looking for or if you’re looking for something particular feel free to email us your search criteria at kswierz@findourpad.com and we can setup a custom search for you. We have hundreds of options not listed on our search tool and we can help find exactly what you are looking for. Some of the search options are include or exclude short sales or bank owned homes, bargain real estate, age restricted properties, condos with laundry hook ups, view properties, homes with RV parking, gated entry homes, waterfront condos with a dock, fully fenced yards, appliance hook ups, detached shop, horse stables, master bedrooms on main floor, 2nd kitchen, mother in law, type of floor coverings, parking type, energy source, lot details like curbs & cul-de-sacs, topography, condo complexes by name, zip code search, and architecture style, & radius search by street address very helpful if you are searching only downtown Seattle real estate listings.